1. Rainwater Inlet (DN 200). 4. Silt Trap to retain sediment. 5. Filter Elements (4 No.). 6. Removal Device for Filter Element. 7. Overflow Pipe and Cleaning Shaft. 9. Outlet to storage or to waste. The rainwater from the connected area is fed into the basal section of the filter housing. The angled inlet generates a radial flow pattern. The hydrodynamic separator converts turbulent waters into a radial laminar flow pattern, generating particle sedimentation, particularly of the sand fraction. This takes place over an inlet to the lower section of the filter shaft. The sediment is retained in a silt trap chamber below the separator. The silt trap needs to be emptied out at intervals. In the central section of the filter housing is the actual filter, Filter Element: Metal. The filter element filters out the fine materials in an up-flow process and dissolved materials are precipitated and adsorbed. The filter is backwashed from above. When exhausted the filter is easily exchanged. The filter element is easily pulled up via shaft openings. Above the filter element is the clean water. It passes via an oil separator and then flows via the outlet into soakaways and so on. Special rainwater filter for installation within standard manhole shafts, 1000mm diameter. The plug-and-play Hydrosystem 1000 is quickly and safely installed on site. Suitable for contaminated waters from trafficked areas and parking lots from 750m² up to 3750m². The cleaned water has such an excellent water quality that it can be discharged directly into soak aways, surface waters and the wider environment. The filter function is an up-flow process and this allows for a design with a minimal height difference between the inlet and outlet. In the filter shaft the rainwater is cleaned by basic operation of the following processes: Sedimentation, Adsorption, Filtration, and Chemical Precipitation. Incoming rainwater is led down to the base section of the filter shaft. A hydrodynamic separator built in the base section promotes particulate sedimentation. The water is led into this separator tangentially and generates a radial flow pattern. Particles settle into the silt trap located below the separation chamber. Above the separation chamber are 4 filter elements, occupying the full shaft width such that all water must flow up through the filter. The Siltation of this filter is slow due to the upwards flow, and the fact that the filter is below the water level. The filter is easily exchanged. Under normal conditions the filter will last for 2-3 years. Specialist rainwater filter for installation within standard manhole shafts, 1000mm diameter. Suitable for heavily contaminated waters from trafficked areas, i.e. over 5000 vehicles per day). Suitable for drained areas up to 650 m². The cleaned water has such an excellent water quality that it can be discharged directly into soakaways, surface waters and the wider environment. The filter function is an up-flow process and this allows for a design with a minimal height difference between the inlet and outlet. In the filter shaft the rainwater is cleaned by basic operation of the following processes: Sedimentation, Adsorption, Filtration, and Chemical Precipitation. Special rainwater filter for installation within standard manhole shafts, 1000mm diameter. The ready-to-install Hydrosystem 1000 is quickly and safely installed on site. Suitable for metal-roof areas from 650m² up to 3250m². The cleaned water has such an excellent water quality that it can be discharged directly into soak aways, surface waters and the wider environment. The filter function is an up-flow process and this allows for a design with a minimal height difference between the inlet and outlet. In the filter shaft the rainwater is cleaned by basic operation of the following processes: Sedimentation, Adsorption, Filtration, and Chemical Precipitation. Specialist rainwater filter for installation within standard manhole shafts, 1000mm diameter. The ready-to-install Hydrosystem 1000 is quickly and safely installed on site. Suitable for roof areas up to 1000m². The cleaned water has such an excellent water quality that it can be discharged directly into soakaways, surface waters and the wider environment. The filter function is an up-flow process and this allows for a design with a minimal height difference between the inlet and outlet. In the filter shaft the rainwater is cleaned by basic operation of the following processes: Sedimentation, Adsorption, Filtration, and Chemical Precipitation. Incoming rainwater is led down to the basal section of the filter shaft. A hydrodynamic separator built in the base section promotes particulate sedimentation. The water is led into this separator tangentially and generates a radial flow pattern. Particles settle into the silt trap located below the separation chamber. Above the separation chamber are 4 filter elements, occupying the full shaft width such that all water must flow up through the filter. The Siltation of this filter is slow due to the upwards flow, and the fact that the filter is below the water level. The filter is easily exchanged. Under normal conditions the filter will last for 2 years, maintenance free. Specialist rainwater filter for installation directly in the ground, for heavily contaminated traffic areas up to 100m². The filter function is an up-flow process and this allows for a design with little height difference between inlet and outlet. The cleaned water has an excellent water quality. The rainwater is cleaned by basic operation of the following processes: Sedimentation, Adsorption, Filtration, and Chemical Precipitation. Incoming rainwater is led down to the basal section of the filter shaft. A hydrodynamic separator built in the base section promotes particulate sedimentation. The water is led into this separator tangentially and generates a radial flow pattern. Particles settle into the silt trap located below the separation chamber. As there is no current there is little remobilisation (washout) of the retained sediment. Above the separation chamber is the filter element, occupying the full shaft width and so all water must flow up through it. The Siltation of this filter is slowed due to the upwards flow, and the fact that the filter is below the water level. The filter is easily exchanged. The complete single filter element is removed using the handle inside the overflow pipe. Under normal conditions the filter will last for 2 years, maintenance free. 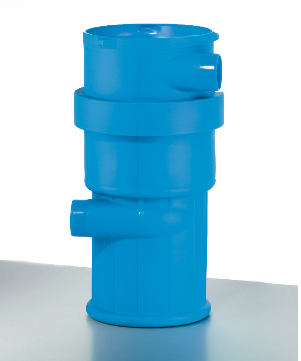 Stormwater filter with a dimension of 400 mm. Suitable for contaminated runoff from car parks, yards or roofs. The cleaned water can be discharged directly into infiltration facilities or rainwater tanks. The filter works by an up-flow process with low head loss. In the system the stormwater runoff is cleaned by sedimentation, adsorption, filtration, and chemical precipitation. Incoming rainwater is led down to the basal section of the filter system. A hydrodynamic separator promotes sedimentation. Particles settle in the silt trap located below the separation chamber. Above the separation chamber a filter cartridge is situated, occupying the full shaft width such that all water must flow up through the filter media. The clogging of the filters is reduced due to the upwards flow, and the fact that the filter is below the water level. The filter cartridges can be easily exchanged. The system is maintained and back flushed once a year. The filter works by an up-flow process with low head loss. In the system the stormwater runoff is cleaned by sedimentation, adsorption, filtration, and chemical precipitation. Incoming rainwater is led down to the basal section of the filter system. A hydrodynamic separator promotes sedimentation. Particles settle in the silt trap located below the separation chamber. Above the separation chamber a filter cartridge is situated, occupying the full shaft width such that all water must flow up through the filter media. The clogging of the filters is reduced due to the upwards flow, and the fact that the filter is below the water level. The filter cartridges can be easily exchanged. The system is maintained and back flushed once a year.